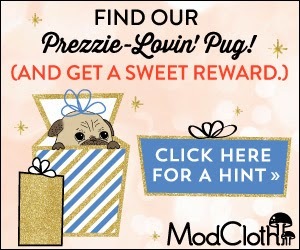 MamaBreak: ModCloth Find a Pug Contest! Did I hear someone say they love pugs? Well you're in luck, because ModCloth is hiding their adorable pug, Winston, all over their site with special rewards for you to shop with when you find him! Start your hunt right now: Find Winston the pug for fun rewards @ Modcloth.com... I found him pretty quick!